Yesterday, we did a day trip to Walvis Bay. Only 30 kms (18 miles) south of Swakopmund. We have to drive back to that area this morning, but we have a long drive today so would not have had time to stop and see the town. Glad we went, because we saw some interesting things. Walvis Bay is a large shipping port, but it also has some local attractions. The bay is full of pink flamingos, and there is a huge salt mining operation that was interesting to see. Also, we drove this long strange road out to the ocean, where we saw some seal pups! On the beach in Walvis Bay we saw these huge jellyfish. The bay if full of pink flamingos. The flamingo is such a strange bird. There are two different types of flamingos, the greater flamingo and the lesser flamingo. Flamingos regularly live to be 60 years old, and there is one in a zoo in the United States that is over 80 years old! This is the greater flamingo. The lesser flamingo is more pink and is slightly smaller. Look at their funny curved neck. But their neck is perfectly straight when they fly! There were a lot of other sea birds around as well. We continued on this dirt road around the bay towards where we saw a salt mine. We didn't have a map of the area, we were just exploring! More sea birds. Don't know what these are. I like the picture though! Salt mine at Walvis Bay. They have these huge flats of saltwater where the evaporation takes place. They put something pink into the water, not sure but we think it must be to speed evaporation. It was so pink, that the clouds in the sky above the flats were also pink! We continued on to the coast in hopes of seeing some seals. When we got there, we looked around and there wasn't much to see. Ruth got the binoculars out and said..."Kevin, there's some baby seals right there!". I had seem the dark spots, but it looked like a black garbage bag fluttering in the wind! So we got out and went for a walk on the sand. Sure enough, two baby seal pups, and they looked very fresh. We would say they were no more than a day old. One looked like it still had an umbilical cord attached. We were only a few feet from them and their mommy was nowhere to be seen. We had read that the mother still has to feed, so will often leave the pups behind but usually with a babysitter. We saw a couple of other pup carcasses on the beach, so hopefully that is not the fate of these two. Apparently the jackals sometimes come to the beach in hopes of a tasty meal! There was a larger group in the distance so we walked over there but didn't get too close. Can you scratch my back please? We drove back to the town of Walvis Bay and took a back road that led to the largest sand dune in the area. Dune 7 is where the tour companies take people for sand boarding. You actually climb up the dune and ski down, similar to snowboarding. We've heard that the sand can be pretty hard on your skin if you wipe out! Dune 7 at Walvis Bay. This would have been a pretty desolate area back in the late 1800's when people decided to come here. Not sure what it was that attracted them. Sand everywhere! And the coast is difficult for shipping with a lot of heavy fog. There are shipwrecks strewn up and down the "Skeleton Coast". We have another long drive today to Sesriem, so depending on internet at our destination you may not hear from us for a couple of days. We've had a good break from the heat here at Swakopmund, but we're back in the desert this afternoon. Oh, by the way, my temporary fix on the fridge is working perfectly. Good thing because we'll be back around 35C (95F) today. Enjoy those dunes. We thought they were stunning colours. Those birds you admired are Pied Avocets. It was nice that you did spot the Seals and Flamingoes, love the sand dunes. Looks just like Imperial dunes in southern California. I found this using Google. "The red coloration is caused by astronomical numbers of microscopic, unicellular organisms called halophilic archaebacteria living in the water and salt crust." The evaporation ponds in the Yucatan are similarly pink. I'm finally catching up on all your travels and am so enjoying myself. 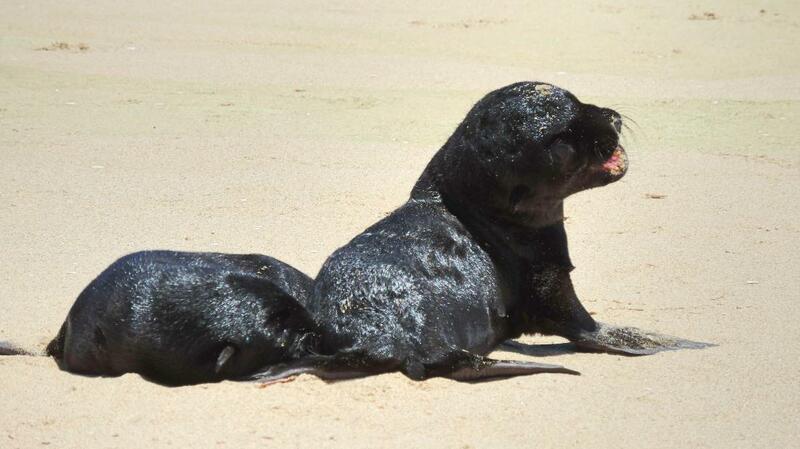 never knew there were seals in Africa. I continue to be amazed at all that you are getting to see. The seal pups are cute, hope mom returns to take care of them. I have seen pink salt. Wonder if that is the reason. I sure hope the pups mother returns for them. Too sad if they become skeletons. Love those Flamingo pictures. I'm not sure there is anywhere in the US where they are native anymore. I heard that they used to be at the tip of the everglades and that's how the town of Flamingo got its name but that could be an urban myth. Sure am enjoying myself but not as much as you two that's for sure. We're so glad you're having a great trip so far! Kathe K. is correct - the pink color is the natural result of micro-organisms living in the seawater. And historically, Walvis Bay was actually a hotly contested for a long time with lots of people wanting to go there, because it is the only natural harbor on the Namibian coastline. In fact, during the German colonial days, Walvis Bay was a British- and then South African-controlled exclave. South Africa retained control of the area until 1994 - 4 years after the rest of Namibia became independent!